Meet Anuj Gupta, our December 2018 #DryTortugas Photo Contest winner. We had the chance to ask him a few questions about his experience at the Dry Tortugas National Park. Read on to learn how he captured his amazing photo! 1. 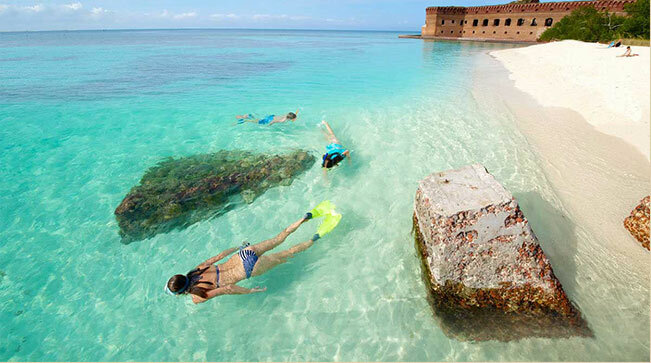 When did you visit the Dry Tortugas National Park? Did you arrive by seaplane, the Yankee Freedom ferry or another way? I visited Dry Tortugas National Park during 1st week of July. I took the full day trip with Yankee Freedom ferry from Key West. 2. If you arrived by the Yankee Freedom, how was your ferry trip? The trip with Yankee freedom was an amazing experience. It's a very well organized trip right from the ferry terminal at Key west to Dry Tortugas national park and back. The crew is outstanding in taking care of the needs of every individual and I loved the choice of food menu that Yankee served. To be honest, all one needs in order to plan for a day trip to Dry Tortugas is just buy a Yankee ferry's ticket apart from right clothing. 3. How did you capture your winning photo? What inspired you to take it? Did you use any cool camera gear? I was standing on the deck of the ferry as we were approaching Fort Jefferson at Dry Tortugas national park. We were around a mile from Fort Jefferson when I saw a tourist standing at the edge of the outer moat of the fort and from a distance it felt as if someone is lost in the beauty of a paradise. I had a zoom lens on my Nikon camera and that helped me to capture this moment. I thought the VR feature of the Nikon lens also helped as it was a little windy too. I am an amateur photographer and I believe that the story in a picture is as important as the camera gear. 4. What made your trip to the Dry Tortugas memorable? It was my Florida national parks trip and i also visited Everglades and Biscayne national parks in the same week. The day spent at Dry Tortugas was probably the most memorable in the entire trip. The fact that one is on a paradise in the middle of the ocean far away from material world and all one is left with is amazing nature, scenery, and beautiful beaches. All one can do is to either snorkel or enjoy beautiful 360 degree views from the fort. The whole experience was memorable. 5. What do you plan to do with your National Park Annual Pass? Which national park would you like to visit next? I love to visit national parks and national park annual pass is a great way of saving money for someone who loves to visit national parks frequently. This year, I have plans to visit Yellowstone national park with my family and I am also planning a trip to Glacier national park. I would love to visit for a camping trip at Dry Tortugas too. Thank you so much for the prize and selecting my photograph for the contest.